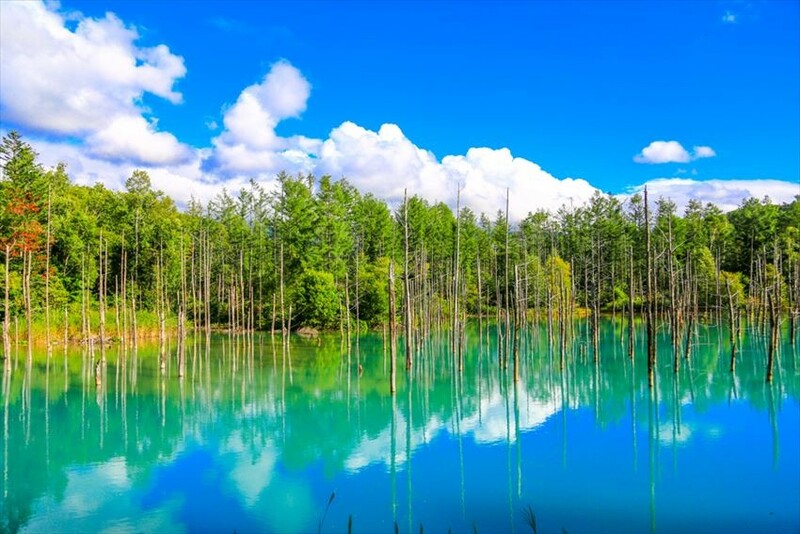 The main tourist attraction spot if you’re on a bus tour towards Biei or Furano in Hokkaido is the popular spot Aoi Ike (Blue Pond). A pond located at the southeastern part of Biei Town, you can see the blue-coloured pond surface, it’s so mysterious. 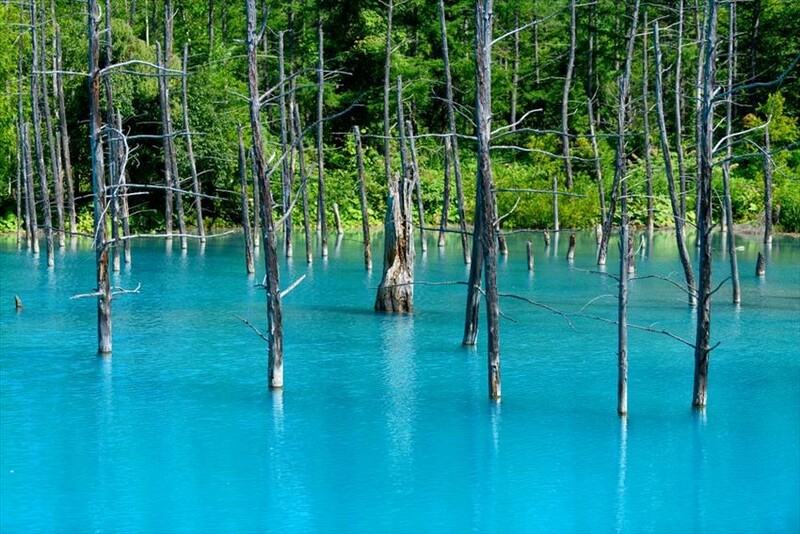 The withered karamatsu (Japanese larch) and the serene blue pool combine to create a wondrous atmosphere. Visit the pond to take some mystical photos of the blue-tinted pond as a memento! The Shirogane Aoi Ike in Biei is also called ‘Blue Pond’. It is one of the multiple dams where the main course of the river Biei flows. It was built from concrete blocks, and was completed in 1980. As a result of the construction crossing the Biei river, in the forest a short distance from the Biei river, water pooled on the sides of the shores, causing the Japanese larch (Karamatsu) growing there to be submerged in water, and they withered while standing upright. Due to the construction of the dam, the incidental beauty of the Blue Pond became widely known thanks to the work of photographers. It is now a famous spot in Biei. You can visit the Blue Pond for free, from sunrise to sunset. There is a parking lot right beside the Aoi Ike (Blue Pond), making it convenient to visit by driving a car. Even though there might be more visitors on 9.00a.m. to 10.00 a.m. in the morning on holidays and summer, if you were to visit in the early morning, the paths should be clear for walks. There are less people around the time before dawn till 7.00am, and you can enjoy the freedom from crowds. As it is a very popular spot, picking the timing to visit is very important. Just before the sun rise, the blue pond looks as if it is a spot from a fairy tale, displaying the beauty of the withered Japanese larch. In the morning, the wind is weak, so we suggest this as the best time to take photos. In terms of weather, the day after a rain, the pond becomes muddy and doesn’t look beautiful, so we would suggest visiting on a sunny or cloudy day. 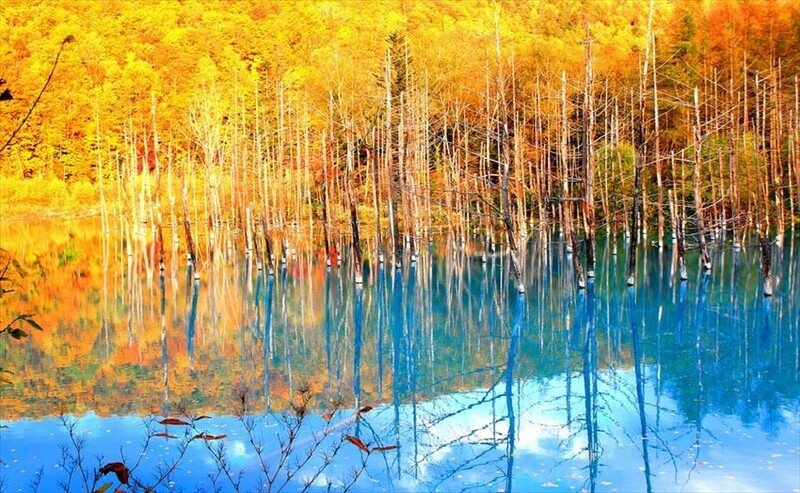 At Aoi Ike (Blue Pond), you can enjoy the different views as seasons change. In Spring, there are cold days when the surface of the pond is frozen. 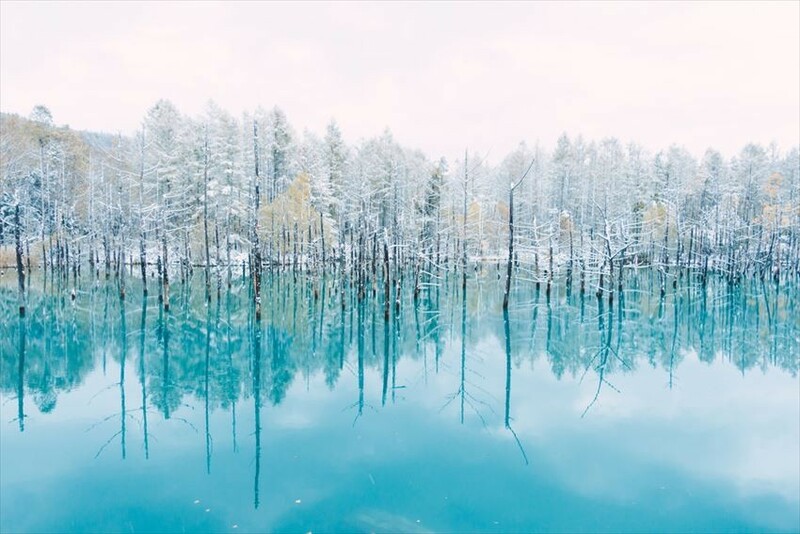 The contrast between the frozen pool and the blue pond is absolutely superb. In summer, ‘there are many days with no wind and little rain’, which makes it a season with many great conditions for photography. There are many days when the strong sunlight where you can see a wonderful scenery. In Autumn, it is predicted that the first snowfall will occur in October, so the time when you could see the red leaves of Autumn is not very long but the red leaves reflected in the blue pool is also a beautiful sight to behold. 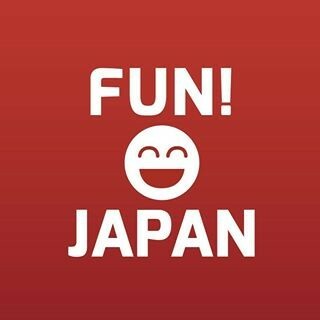 In Winter, there will be illumination on the pond and the trees, and you can drink in the sight of the fantastic scenery. The illumination is will be lit until 9.00 pm within the duration of the light up event. Access: A 20-minute car drive or bus ride from the JR Biei Station.